As reported by Sara Jean Green from the Seattle Times: In her final days in office in 2013, former Gov. Christine Gregoire (demorat) commuted the life sentence of a man now charged in connection with the shooting death of a 24-year-old man at a Kent motel earlier this month. Stonney Rivers, 50, was charged last week with first-degree murder and is being held without bail, court and jail records show. Rivers, who was sentenced to life in prison after being convicted of his third strike in 1995, had his sentence conditionally commuted and was released from prison in January 2015, court records say. He served two years on community supervision, which ended in January. Rivers is accused of fatally shooting David Cabrera in the face during a drug robbery at a Kent motel on Nov. 2, charging papers say. He is also charged with second-degree assault for pointing a gun at Cabrera’s girlfriend and threatening to kill her, say the charges. If convicted, Rivers would again be subject to a life sentence, the charges say. “Rivers continues to commit crimes, even when he is on community custody and even after being given a once-in-a-lifetime second chance through a governor’s commutation,” Senior Deputy Prosecutor John Castleton wrote in charging papers. A second man, Theneious Swafford, 47, has also been charged with first-degree murder and is accused of driving Rivers to and from the motel in a silver Lexus that he was in the process of buying but then returned to an Auburn car dealership, charges say. The car would end up providing Kent police detectives with crucial clues that first led them to Swafford — who had used a fake name and driver’s license to purchase the vehicle — and through his social-media profiles, to Rivers, say the charges. Swafford is now also facing his third-strike offense and if convicted would face a life sentence. Just before 7:30 a.m. on Nov. 2, Swafford pulled into the parking lot of the Golden Kent Motel and spent the next 12 minutes in a room occupied by Cabrera and his girlfriend. Cabrera went to bed and his girlfriend was tidying the room when a second man entered the unlocked motel room without knocking, the charges say. The couple told the man to leave, but he pulled a gun from his waistband and shot Cabrera in the face, say charging papers. Cabrera’s girlfriend ran from the room and hid outside, then went to the office and asked the manager to call 911. She then followed Rivers to the parking lot of an adjacent motel. Police identified the gunman as Rivers, matching surveillance images with his driver’s-license photo and photos posted on social media, the charges say. On Nov. 11, Rivers turned himself in at the King County Jail on an unrelated felony warrant associated with identity-theft charges, say the charges filed in the homicide case. Police say Rivers admitted going to the Kent motel to buy crystal meth but claimed he didn’t hurt or kill anyone, say the charges. 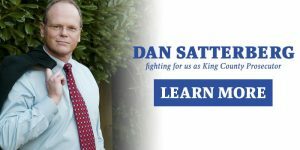 Gregoire, in a statement released Wednesday by her former chief of staff, said King County Prosecutor Dan Satterberg, members of the state Clemency and Pardons Board and the judge who sentenced Rivers to life in prison all recommended that his sentence be commuted. Rivers had been sentenced to life after being convicted of second-degree robbery, the statement says. “Their recommendations carried great weight with me,” she wrote. By the time of his 2015 release, Rivers had served 20 years in prison, Gregoire noted. “Robbery 2 typically results in a sentence of two to three years. Based on these recommendations and the facts available at the time, to include his performance while in prison, I conditionally commuted Mr. Rivers sentence to his time served subject to compliance with twenty-one different conditions,” Gregoire said in the statement.